Arrangements is a modular system of geometric light elements that can be combined in different ways, creating multiple compositions into individual chandeliers. 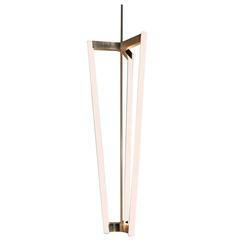 Each unit simply attaches onto the previous one as if resting, balancing perfectly as a part of a glowing chain. Overall: • Weight: 10.6 Lbs • Power: 84 W • Lumen: 4536 Lm Elements: Large circle: • Mounting: Suspension • Lamp (Bulb) Description: 54W LED custom 2700K CRI90 2916lm delivered • Environment: Indoor - Dry location • Dimming: 0-10V • Finish: Black • Voltage: 120-277 • IP Rating: IP20 • Construction material: Aluminium, silicone, polycarbonate Drop down: • Mounting: Suspension • Lamp (Bulb) Description: 30W LED custom 2700K CRI90 1080lm delivered • Environment: Indoor - Dry location • Dimming: 0-10V • Finish: Black • Voltage: 48VDC • IP Rating: IP20 • Construction material: Aluminium, silicone, polycarbonate. This item is compatible only in the United States and Canada. For customers located outside of these regions, please inquire for availability in your area.